10 Bits Of Trivia That Make Airstream Trailers Just That Much Cooler - Die Feuermacher Feuershows und mehr ! Little-known Airstream facts you’d never guess are real. When it comes to classic RVs nothing much beats the Airstream trailer for slick styling or rich history, but there may be a lot of things you don’t know about your favorite trailer. Throughout its history, the Airstream has garnered a lot of fans and attention. Here are ten facts about Airstream that may surprise you! 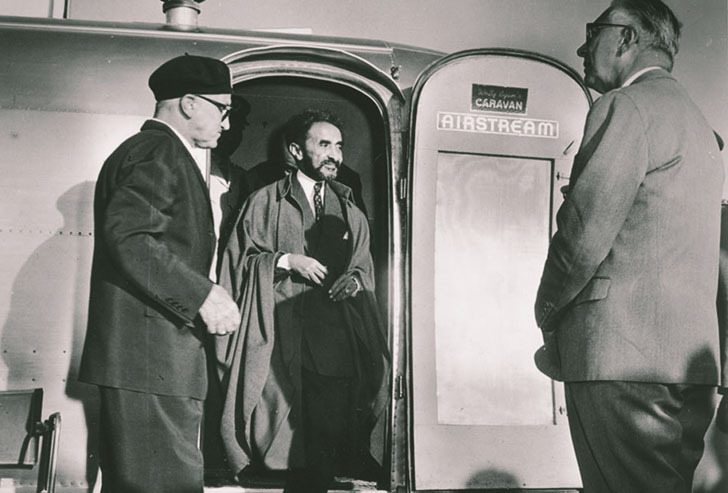 Airstream founder, Wally Byam greets his friend, Haile Selassie, Ethiopian Emperor. 1. The Airstream trailer was developed by an attorney – and started out as his hobby! When Wally Byam (the founder of Airstream) built his first trailer, he published an article with the plans for it – and quickly sold over 15,000 copies for $1 each. This was enough to convince him that there was a market for a lightweight travel trailer for American families. One of Airstream’s early trailers parked outside their factory. 2. Byam built his own trailer to get his wife out camping! She refused to go unless she could have a kitchen. From the very beginning Wally was aiming for comfort. His first attempt was a tent mounted on a Model T platform. His first wife was not a fan, so he built a more permanent teardrop shaped trailer and added an icebox and stove. The Airstream factory showroom, displaying models and features. 3. The first Airstream sold for well under $2,000. While this seems like a bargain at today’s prices, it was a gamble for Wally, who had already taught over 15,000 people to build their own for under $100 each with his magazine article. 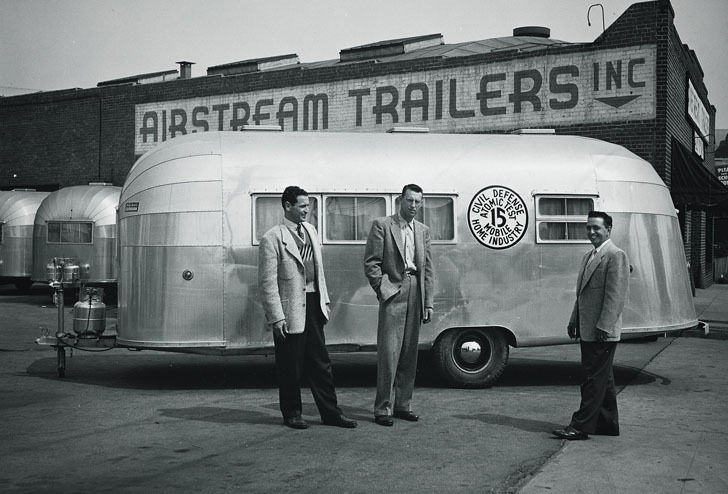 Airstream was founded in 1936 and the first model slept four. From the beginning, Wally hosted huge events for his fellow “Airstreamers”. 4. 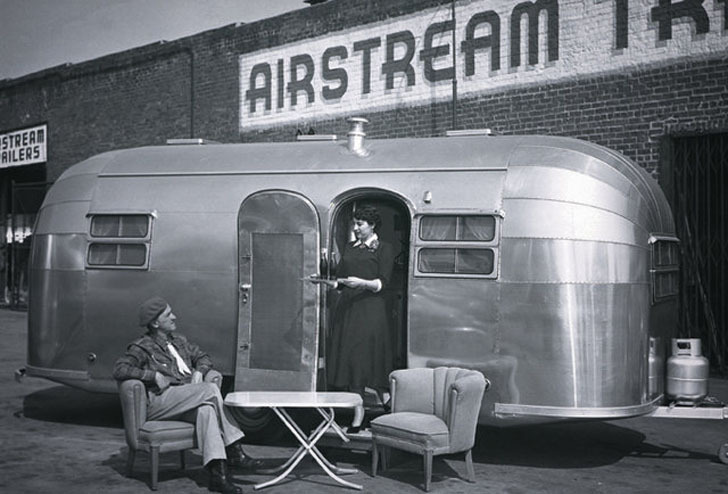 Out of 400 manufacturers, Airstream was the only one to survive The Great Depression. When the company started, trailers became a big hit and over 400 companies sprang up to support the growing industry. 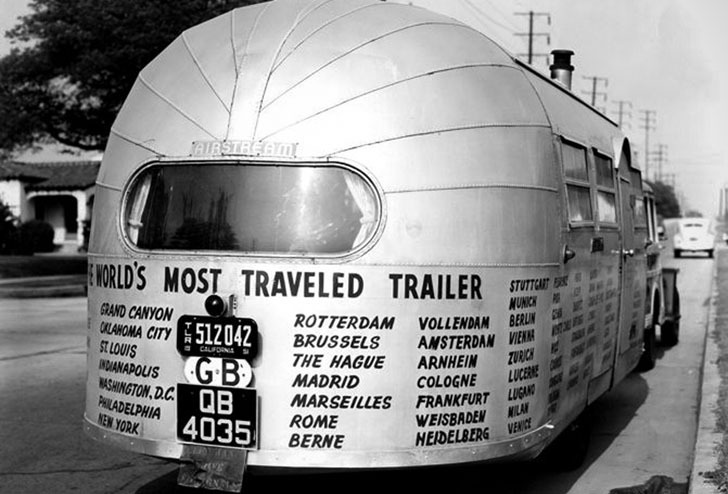 By the time the Great Depression and aluminum rationing of WWII were finished, Airstream was the last man standing. Check out the impressive list of destinations this Airstream traveled to. 5. Airstream is a not just a trailer, it’s a counter-culture! From the very beginning, a big part of Byam’s vision was one of community. He loved to travel and would gather “Airstreamers” from all over to take incredibly adventurous trips, sometimes shipping trailers overseas for exotic road trips. 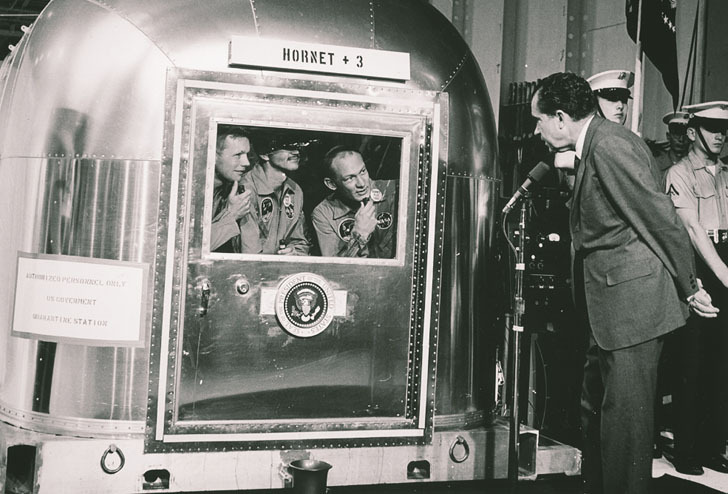 Richard Nixon speaks with Earth-returned astronauts in their Airstream quarantine vehicle. 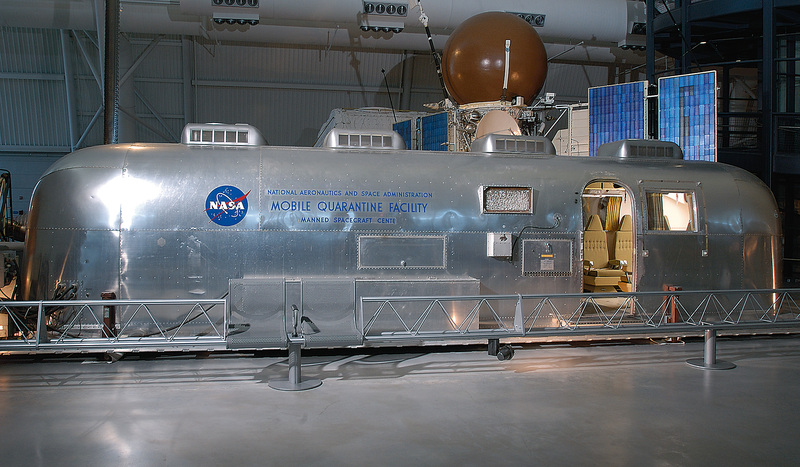 The NASA quarantine trailer on exhibit. 6. 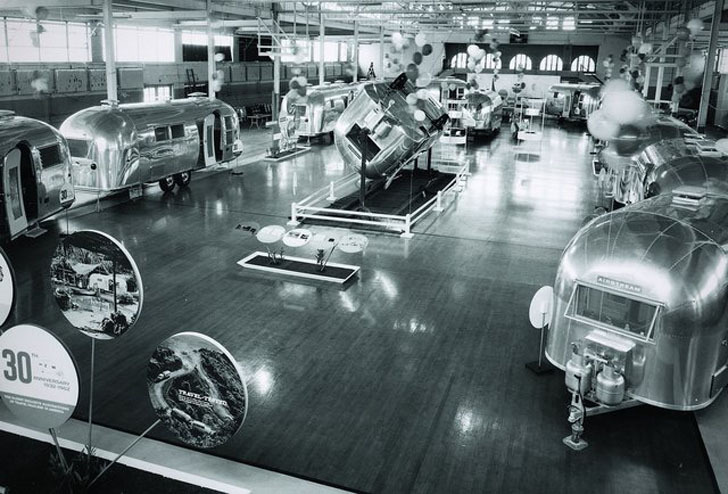 NASA used an Airstream to quarantine the first men back from the Moon. Afraid that our astronauts might have engaged some exotic disease on their travels, NASA placed the crew in a specially outfitted Airstream trailer until they were convinced there was no risk. It was used from Apollo 11 to Apollo 14 and can still be seen on exhibit today! This airstream is serving as quarters for the Vice President in this Airforce cargo plane. 7. Airstreams are used as official transports for dignitaries when flying them in Airforce cargo planes. We’re used to seeing POTUS step out of a specially outfitted luxury jet, but when important government officials must join our fighting men and women at the front, rather than subject them to Spartan conditions, an Airstream is nestled into the cargo bay to serve as their private quarters. Workers at the Airstream plant assembling a trailer shell. 8. 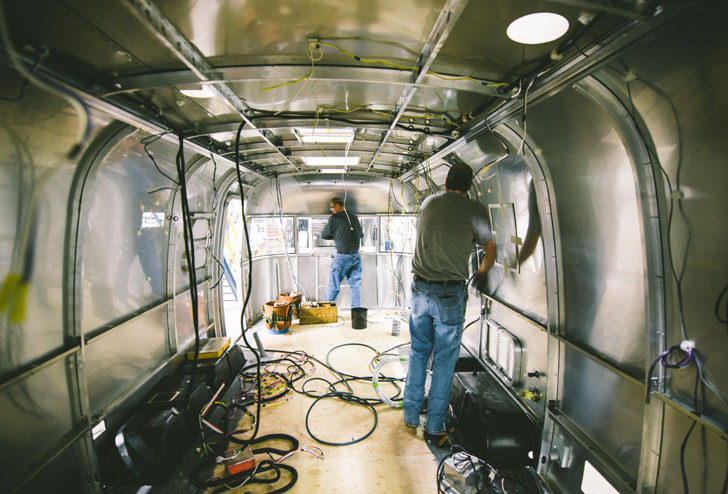 It takes 280 man hours to build a single Airstream trailer. If one man were to do all of the work, that would equate to seven 40 hour weeks. In manufacturing time, this is an eternity. Toyota’s website, for example, gives an estimated 17- 18 man hours for even their most luxurious models. An Airstream being water tested with high pressure jets. 9. 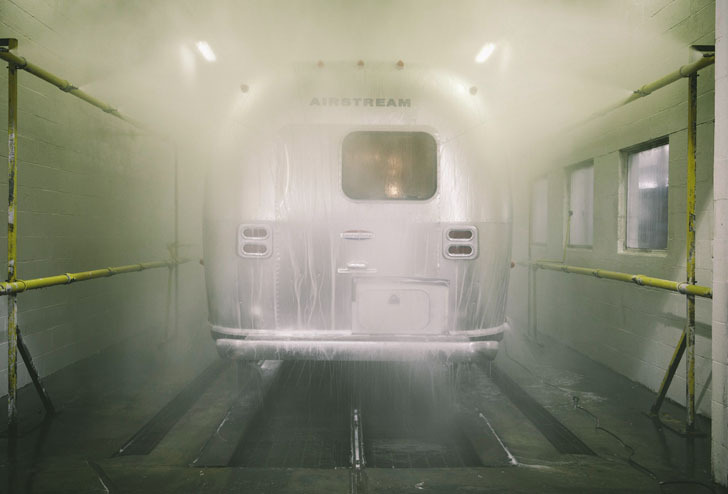 Airstreams undergo extreme weather testing before leaving the factory and every one must be water tight. Each trailer is subjected to a test for water-tightness once construction is complete. In a specially designed area, they are blasted with water at one hundred pounds per square inch for forty minutes to ensure that the envelope is water tight. One of the atomic testing office trailers outside the Airstream factory. 10. 7 out of 10 Airstream trailers ever manufactured were still road worthy in 2006. 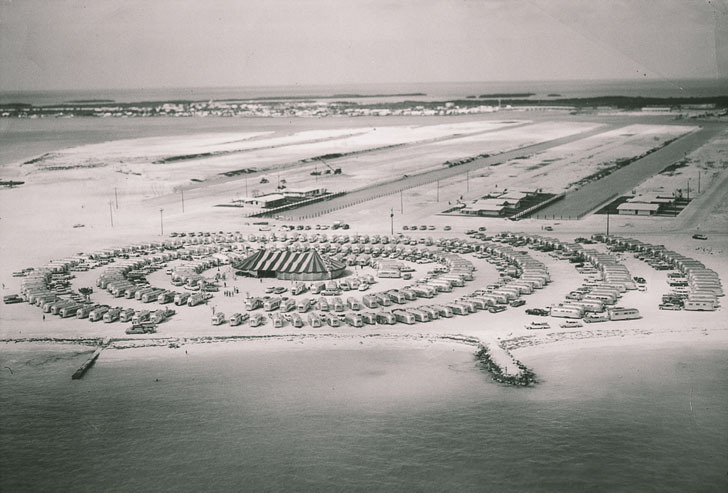 This is due to the time and care taken in their manufacturing, and this includes trailers used for offices during the atomic bomb tests, which were subjected to intense radiation. This is why so many RVers looking for a classic to rebuild will choose an airstream for its rugged durability as much as the classic good looks.